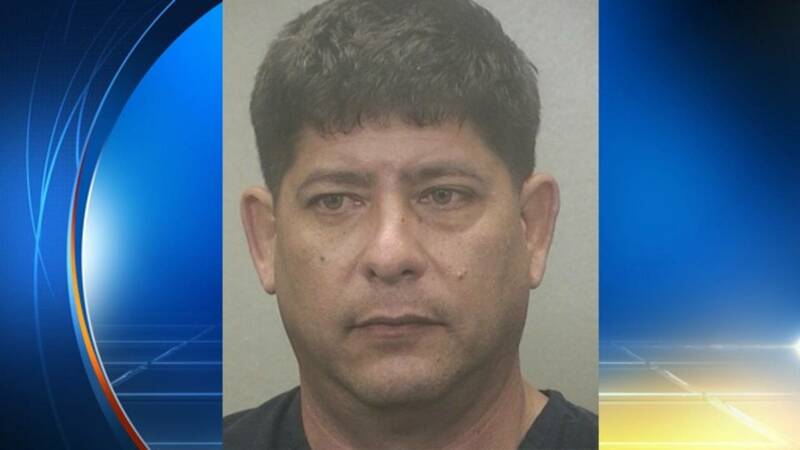 HOLLYWOOD, Fla. - A 44-year-old man from Hollywood is facing domestic violence and false imprisonment charges after beating his girlfriend and locking her in a bedroom on numerous occasions, police said. According to an arrest report, the victim called her uncle Tuesday, telling him "she couldn't get away" from her boyfriend, Rafael Burgos. The uncle told police that his niece called him several more times and said Burgos had pulled a gun on her. That's when he called police. Police arrived at the victim's apartment and said she had red markings on her neck and face. Officers also said she had a spot of blood on the right side of her bottom lip, but claimed "nothing happened." Police said Burgos had a blood stain on the bottom of his shirt and injuries to his hands. They said Burgos too stated that "nothing happened." Burgos was taken into custody and the firearm was confiscated as evidence. Police said after further questioning, the victim told detectives that Burgos grabbed her by the neck and slapped her in the face multiple times. She also claimed that over the past four years, Burgos would routinely lock her in a room and hold her against her will in his upscale home on North Lake Drive. Burgos appeared in bond court Wednesday where he was ordered held in jail in lieu of $22,500 bond.